Could a marriage between Célimène Dessalines and Alexandre Pétion spare the Emperor? Could a marriage between Celimene Dessalines and Alexandre Petion spare the Emperor? The slave revolution in Saint Domingue (Haiti) could not have been possible without a union of Blacks and Mulatos in the island. 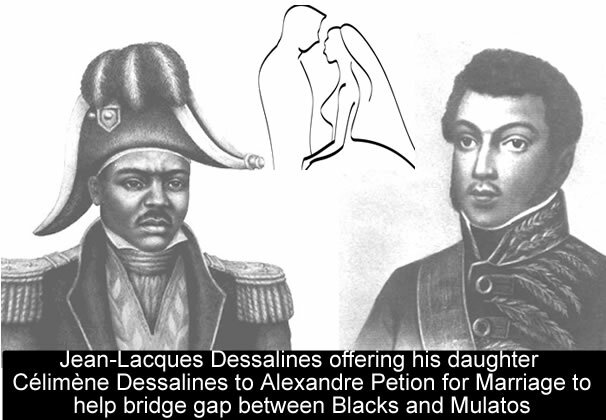 After Haiti's independence, the leader of the revolution, Jean-Lacques Dessalines, had this great idea that his daughter could help bridge the gap between Alexandre Petion and himself by proposing that his daughter would marry Alexandre Petion, the Leader of the Mulato force who fought side by side with him. He also saw this as a way to bring both Blacks and Mulatos together. Marie Françoise Célimène Dessalines was born on October 2, 1789. She was the daughter of Jean-Jacques Jacques I. Dessalines , the first Emperor of Haiti and Marie-Claire Happy Bliss GUILLAUME , Empress consort of Haiti. At the time, she was romantically involved with young Captain Chancy, a nephew of Toussaint Louverture. It was reported that the marriage proposition between Marie Françoise Célimène Dessalines and Alexandre Petion was declined by Petion. He would later, according to some historians, take part of the assassination plot against Jean-Jacques Dessalines. Could the marriage between Célimène and Pétion actually saved Emperor Dessalines' life?